It’s one of the UK’s most iconic dishes and it’s featured front-and-centre on our menu. Alright, we realize this applies to most of our items but today we’re talking about the always-popular bangers and mash. 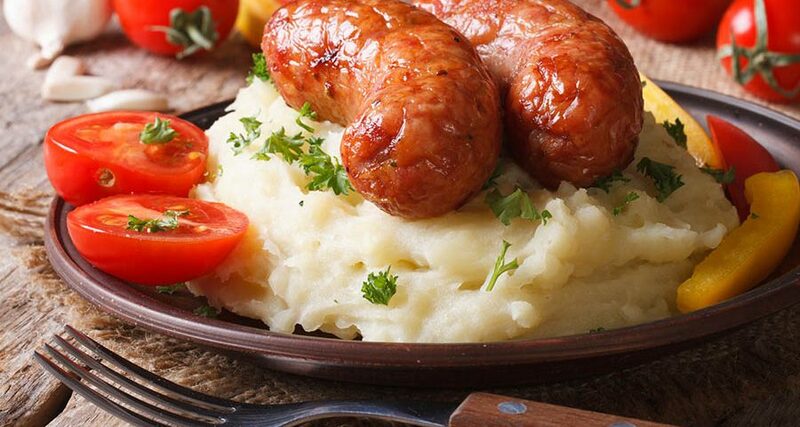 This rich meal, mainly consisting of mashed boiled potatoes, sausages, and gravy, has been filling bellies in the British Isles for a surprisingly short period of time. Indeed, bangers and mash hadn’t become what it is today until around WWI. However, the population’s consumption of its individual components dates back much further. These little tikes are also known as sausages and they go back a long way, to around the 4th century A.D. At least that’s when the Romans were thought to have introduced them to Britain. But it wasn’t until the rule of Charles I (1625-1649) that sausages were divided into links for the first time. Fast forward a few more centuries and we find the humble sausage to be favourite of the British working class. But when did sausages become “bangers?” Right around this time in history, actually. You see, meat supplies had become rather scarce in Europe during WWI. So, to keep production going, sausages had to be filled with cheaper ingredients and more water than usual. This caused them to pop, or “bang,” in pans while being cooked. The name stuck, even though you don’t have to worry about your bangers being cheaply made these days. Should you fancy learning more about this staple meat product, we recommend checking out the British Sausage Appreciation Society. They’ve got loads of cool info and host a UK Sausage Week every year. Keep an eye out for it! In a previous article we elucidated on the origins of the British potato. Well, not much has changed since then. So, while we won’t be able to offer many new and exciting facts about potatoes in their natural form, we can chit-chat about their creamy cousins, mashed potatoes. In the UK, mashed potato recipes began emerging in the mid-18th century, notably in The Art of Cookery (Hannah Glasse, 1747). In those days, the recipe consisted of potatoes, butter, milk or cream, and a little bit of salt. Do you want to know what’s interesting? They’re made with the same or very similar ingredients today, although if you’re feeling intrepid you can add things like bacon bits, garlic, onion, cheese, and so forth. But for the most part, there’s no reason to complicate the elegant simplicity of “mash,” and that makes it the perfect companion to a banger. The world is a better place with bangers and mash. Ordering a plateful of it is akin to connecting with a good old friend as it’s sure to warm your spirits regardless of the kind of day you’re having. At the Thompson House, we like to jazz it up with caramelized onion and Jameson gravy. Sound yummy? We’d be happy to serve it up for you any time!